I participated in Manila Cup 2017’s Street Fighter V’s tournament over the weekend. It was the second time I tried my hand in “professional” esports because I did join last year’s Manila Cup. That time, however, I was a little overwhelmed by nervousness of actually practicing my mettle against the best players in, not just the Philipines, but the entire world. In fact, I was more excited to meet the professional Street Fighter players like Justin Wong, Ricki Ortiz, K-Brad, Kazunoko, Gamerbee, Gootecks and Mike Ross than to play the game! So, when I promptly got eliminated from last year’s Manila Cup Street Fighter V tournament, I didn’t really care as the experience of rubbing elbows with the elite of fight game competitors. I just was happy to have the opportunity to meet them… and get a few photos with them, of course. This year, though, I was a little bit more observant with stuff. My mind wasn’t clouded by meeting all the top players of the world… Well, not that clouded as I was still awestruck by the likes of Infiltration, Mago, Gilty and Sako, to name a few. But I wasn’t too sucked up in the hype to notice the itty bitty things you may not realize when you play at home against your friends or online. There are a few things that I learned from joining my second professional fighting game tournament. 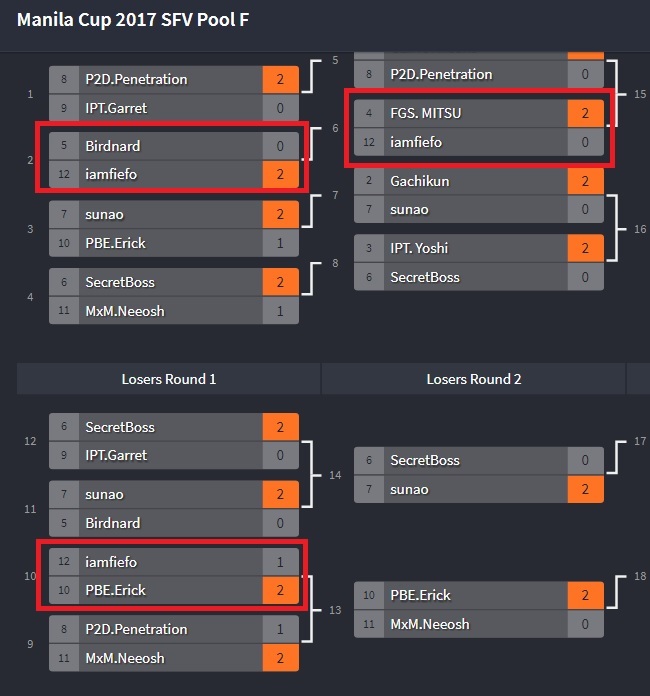 One of the hardest things to explain to people who haven’t seen a fighting game tournament before is the double elimination tournament structure. It’s actually quite simple. Everyone starts out in a single bracket as normal. However, unlike a single elimination tournament, when you lose, you’re not sent home immediately. In a double elimination tournament, all the losers are sent to another bracket and they have to fight it out. This time, if you lose, you’re gone. Think of it like a “second chances” bracket. The champion of the “losers” bracket will eventually get to face off against the champion of the “winners” bracket. But the guy (or gal) from the losers side will need to beat the guy (or gal) from the winners side twice because the former will have to send the latter into the losers side as well. That’s the basic gist of it. Of course, there are other things like seeding to make sure that the best players don’t eliminate each other early and the like but what I mentioned is the simplest explanation and is much easier to understand when you see it in action. What I mentioned is the general process on how fighting game tournaments have been run and I’ve always thought this was the practice for several reason. For one, it made sense for a fighting game tournament to use the double elimination set-up since, in most fighting games, you need two of everything to win or lose. You need to win two rounds to take a game. You also need to win two games to move on. Also, the double elimination makes it extremely exciting for the viewer. There’s the drama of someone clawing their way out of losers, reset the brackets and make the come from behind victory. However, after this year’s Manila Cup, I realized that the double elimination tournament is more for the people in the tournament than anyone else. This year, I actually kind of got a buy for my first match as the guy I was supposed to face didn’t attend. My next match was with a Dhalsim and I just couldn’t get in with my Vega. This guy annihilated me because he just kept checking me with Dhalsim’s incredibly long range pokes and I got booted to the losers pretty quickly. And, I will admit, most of the reason why I lost was my own fault. I was pressing buttons when I know I shouldn’t be because I was extremely nervous. This may be my second tournament but this was the first one that I took semi-seriously. I was extremely salty because of my own stupidity. I did regain my composure during my first losers match. Okay, I still lost against that Akuma player but I was more aware of my own mistakes during the match and I did make enough adjustments to actually take one match, which was much better than before. Officially, my record is 1-2 at Manila Cup. I only managed to adapt because I had the time to shake off the cobwebs. Since I’m not a pro gamer, I don’t have the ability to just turn on my best in an instant. I needed time to warm up. While I did get a few casual games in before the actual tournament, it still felt different when in an actual tournament match. I do realize that I have to be able to play my best if I actually want to do well in a tournament but I also imagine how demoralizing it would be for newbies in the tournament scene to get eliminated after just one game. I don’t think they would want to join another tournament again. There’s also no way a lot of players would get really good in a tournament setting if they would be eliminated early. Having fighting game tournaments use the double elimination tournament style will make it more enticing for new players and actually help them to get good as they do get a chance to play again. Speaking of newbies, I was half expecting everyone in the tournament to be killers. I knew some top tier players from around the world were going to be there. Former EVO champions Momochi and Infiltration (the latter won the entire Manila Cup in dramatic fashion, which I’ll get into a little later) were just a few of the top tier players that came to Manila Cup this year. It would’ve been even more stacked if Daigo Umehara was actually able to make it as advertised. Even without The Beast, there were a lot of top caliber players this year. That’s not to say the local players were going to be pushovers. I mentioned that I lost to an Akuma player in losers, right? Well, I played a few matches against him before the tournament started and he was really good. He kept punishing my dash ins and it took me a while to figure it out. I will say I got a few lucky hits in, which is why I got a game over him. It’s all a blur, really. However, I do recall asking him how he was attacking me when I dashed in because I wanted to know if I was being too predictable. Apparently, he was simply reacting to the dashing animation. That’s something I can’t do and I was impressed! I was less impressed with another guy I played against in casuals, however. The guy used the same tactics over and over again, making it easy to predict what he was going to do. I also noticed that he didn’t know how to counter Vega’s Wall Dive so I just abused it whenever I wanted. And this was another person who joined a Capcom Pro Tour event? Well, that’s actually the beauty of a fighting game tournament: anyone is welcome to join! I know a lot of the players that decided to participate were like me and they didn’t expect to make it out of their pools, much less Top 16. But to be able to play against some of the best players out there? It’s actually the opposite of intimidating because there is no pressure to win! Losing to them is expected. However, gaining the experience of playing against them and getting the feel of how they react to the things you do and learn from them? That’s something you can’t experience unless you go to a tournament! When you watch a typical fighting game tournament on Twitch, you’ll probably see a few dissidents in the chat room complaining about the game that’s currently streaming. Maybe they’ll say Street Fighter is boring. Or they’ll say Tekken is the fighting game to get. 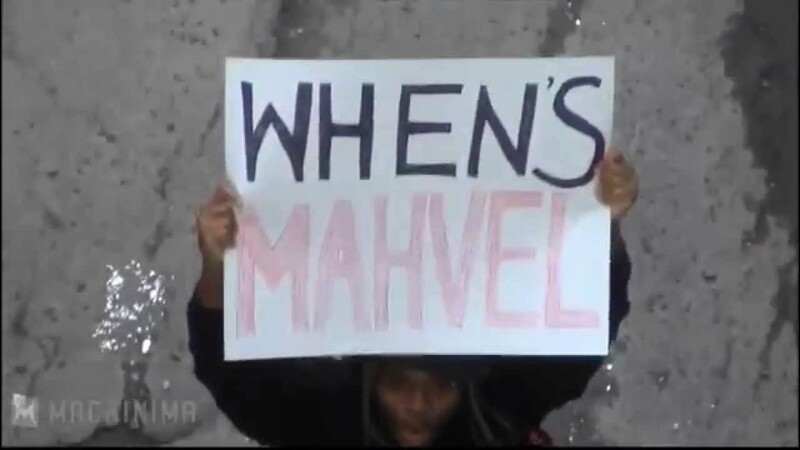 They’ll also be some fans asking “when Mahvel” or something or other. I do have this kind of reaction at time whenever I tune in a stream and I don’t see my favorite games being played. Why would I care if Guilty Gear, Tekken, Super Smash Bros. is on? I’m more of a Street Fighter and Marvel guy myself so usually don’t turn on Twitch until those games are on the stream. However, when you are at an actual tournament venue, you can’t really do that. Although Manila Cup was a Capcom Pro Tour event, it wasn’t just a Street Fighter tournament. There were tournaments for the latest fighting games out on the market now. Most of the finals were conducted on the second day of the event and I was instantly sucked into watching those rather amazing Grand Finals matches. It would have been possible for me to just go to the event and wait for the Street Fighter V finals but I wanted to get there early to get a good seat and maybe hobnob with a few of the professional players to get their autographs if possible. I got to the venue during the Top 8 Grand Finals of Tekken 7, a game that I have plans to get but I don’t really care all that much for. I don’t know all of the mechanics and I don’t really like the combo system in Tekken as I’ve always felt it relies too much on alternating from high and low attacks and just hitting your opponent into the air and juggling them for a long combo. However, after watching the entire Tekken 7 Grand Finals live at Manila Cup, I will say I do have a new found appreciation for the game. I probably didn’t understand most of the nuances of the game and I probably really have to look up how to properly use the Rage Arts and Rage Drives but I do think I got the idea that it’s like a Super/Ultra Combo and you can only use it if you’re down in life and you want to make a comeback. But the game looked really good in the hands of the professional Tekken guys, or, at least, the people that actually know the ins and outs of the game. I’ll probably never get on the level as the top players but, boy, did they make the Tekken look extremely fun! Manila Cup had a lot of sponsors. There was Purefoods Tender Juicy Hotdogs, Frutas Coconut Juice and… Goddamit! B’lue Water… because it’s better than water. It’s just water with sugar so how can it be better than water when it’s water that’ll give you diabetes? A part of me was glad that the people who watch the stream were actually horrified by the B’lue water ad whenever it played. There was one sponsor that never got mentioned, however, and that’s Red Bull. We were practically swimming in Red Bull there and they were just handing it out for free. There were even minifridges full of the stuff! But I guess some guys just couldn’t handle their Red Bull as there was a lot of it on the floor, leading to a very sticky floor. Yeeech! Have you participated in a fighting game tournament? What other lessons have you learned from them? Let me know in the comments section below!